The conflict between Windows and NVIDIA Graphics Cards is not new. While installation of NVIDIA Graphics card, if you get the error “NVIDIA Installer Cannot Continue” error in Windows 10, then don’t be surprised. This error is something many people get while installation of different models of NVIDIA Graphics Card. Fortunately, there are solutions available to this problem. You may be able to solve this issue within a couple of steps, or it may take several steps for the same. In the following article, I will be discussing several methods to fix NVIDIA Installer Cannot Continue error. Try out these methods in the order they are mentioned to solve the issue quickly. Step 1: Press Windows + X keys simultaneously, and then from the list that appears, click on Device Manager. Alternatively, you can click on the Start button, and type “Device Manager” in the Start search bar. Click on Device Manager result that appears. This will open the Device Manager tool. Step 2: Look for Display adapters option, then click on it to expand its options. Among the expanded items, look for NVIDIA Graphics card option. 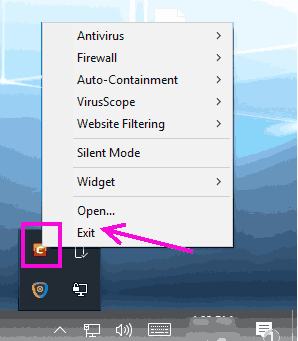 Right click on it, and select Uninstall Device Driver Software option from the context menu. Step 3: – Now, Restart Your Computer. Once you restart your PC, Open Device Manager again. Expand Display Adapters. 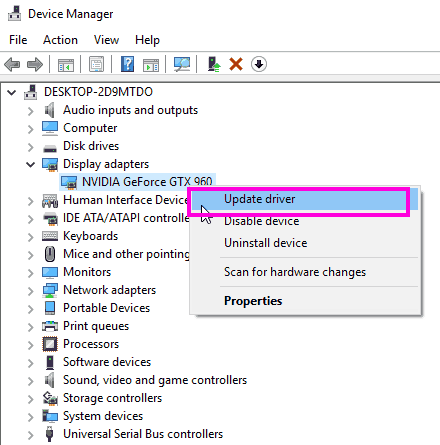 Step 4: – Right Click and Update NVIDIA GeForce GTX 960 Driver. Step 5: Now, a new Update Drivers window will open. 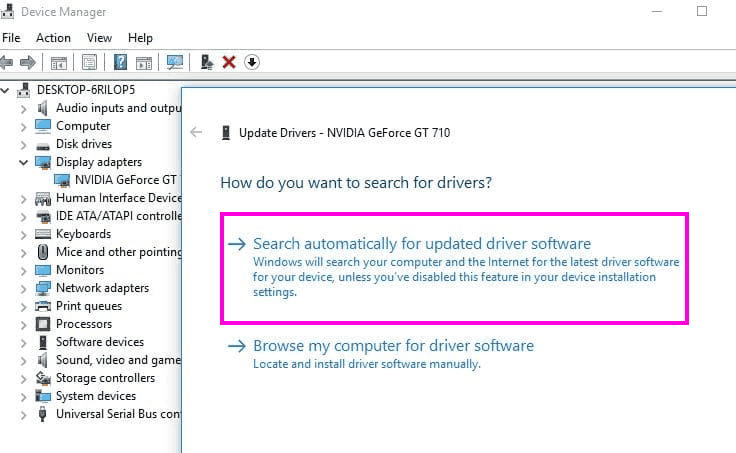 In the window, click on the Search automatically for updated driver software option. Step 6: Follow the installation instructions that will come on the screen to get your NVIDIA Graphics Card driver updated. Step 7: Once the installation of the driver is complete, restart your computer. After restarting, try to Install NVIDIA Graphics Card and see if the same error shows up. It may happen sometimes that Windows will not be able to search for updated NVIDIA Graphics Card driver. In such case, you can manually update the driver. We discuss that in the next method. Step 1: Press Windows + X keys. In the menu that appears, look for Device Manager and click on it. Step 2: In the Device Manager window that opened, look for Display adapters; click on it to expand it. In the expanded list, look for NVIDIA Graphics Card driver. Right click on it, and see if Enable option is available in the right-click menu. If yes, that means NVIDIA Graphics Driver is disabled. Click on Enable. Step 4: Try to install NVIDIA Graphics Card and see if the NVIDIA Installer Cannot Continue issue in Windows 10 still shows up. If yes, try Method # 2 now. Step 1: Open Start menu, and in the search bar of the Start menu, type Taskmgr. 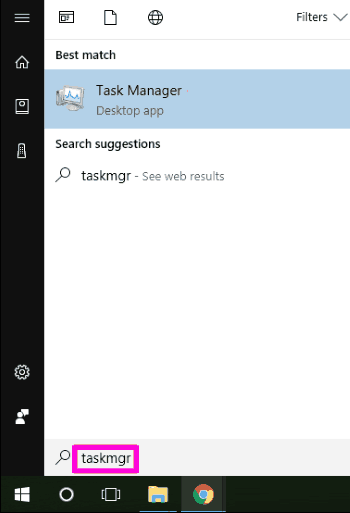 Click on the Task Manager that showed up in the search result. Step 2: Look for NVIDIA processes in the Processes tab. When found, right click on each of them, then click the End Task option. This will stop all the ongoing NVIDIA processes. Ste 3: Now, try to re-run the installation of graphics card and see if the error still shows up. 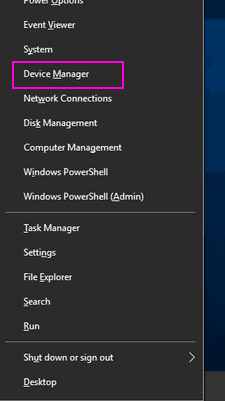 Step 1: Open Start menu, and type Device Manager in the start search box. Or, you can press Windows + X keys, and select the Device Manager option from the list that opens. Step 2: Look for Display Adapters option, then click on it to expand it. From the expanded list, right click on NVIDIA Graphics Card option. Click on Properties option from the right click menu. Step 3: In the Properties window, click on Details tab. In the Details tab, click on Property drop-down, and select the Hardware IDs option. When you do that, the Hardware IDs will appear in the Values box. 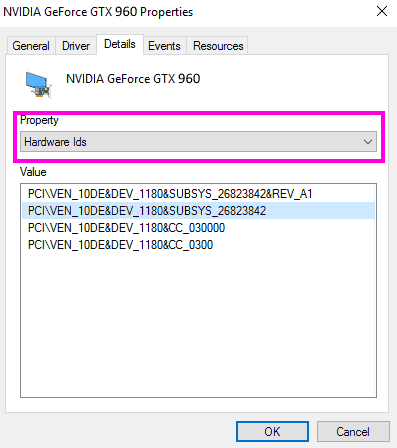 Step 4: In this step, we identify the Vendor and Device code of your NVIDIA Graphics Card. The code after VEN is vendor code and the code after DEV is the device code. For the given screenshot, 10DE is the vendor code and 1180 is the Device code. Step 5: Now go to a website that lets you find and download drivers of devices with their device and vendor code. One of such websites is Device Hunt . There, enter the VEN and DEV codes of your NVIDIA Graphics Card. Step 6: The website will look for the latest driver compatible with your graphics card. Step 7: Now, download the graphics card driver found on the website. Step 8: Install the driver exactly as shown in Method 6. Step 9: Restart your PC after successfully installing the driver, and try to install NVIDIA Graphics card on your computer and see if this works. 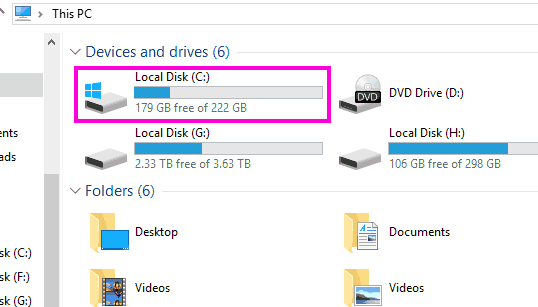 Step 1: Go to the drive where Windows is installed. Usually, it is installed in C Drive. 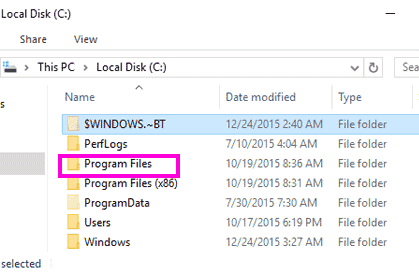 Step 2: In that drive, look for Program Files folder and open it. 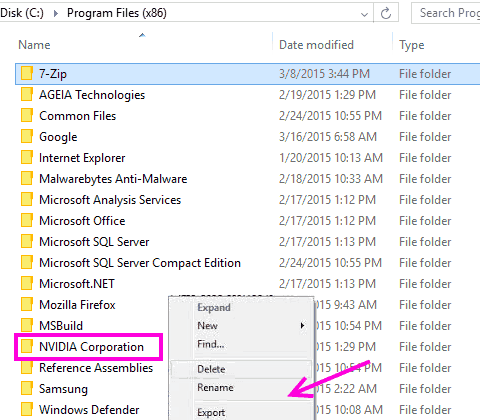 Step 3: When in Program Files, find the NVIDIA folder. It is usually named NVIDIA Corporation. Right click on NVIDIA Corporation folder, and select the Rename option. You can name it anything. For better reference, name it something closely related to the graphics card or NVIDIA; it’s your choice. Step 5: Try to Install NVIDIA Graphics Card on your computer again. The method didn’t work for you? It’s time to play with the NVIDIA drivers. 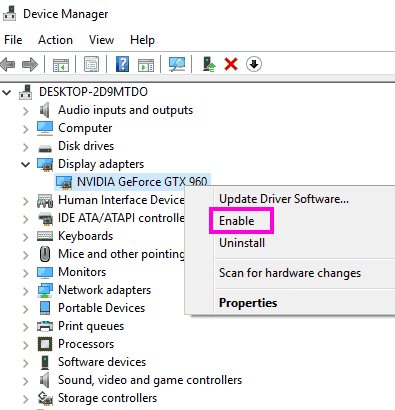 To upgrade NVIDIA Graphics Card Driver Manually to fix the NVIDIA Installer Cannot Continue error, first of all, you will need to download the latest compatible driver for your graphics card on your computer. To do so, go to the NVIDIA – Download Drivers webpage. There, you will need to provide the following information about your graphics card along with the Operating System installed on your computer: Product Type, Product Series, and Product. Step 1: Press Windows + X keys at a time on your keyboard, then a list will appear. From the list, double click on the Device Manager option. Step 2: In Device Manager, click on the Display adapters option to expand it. 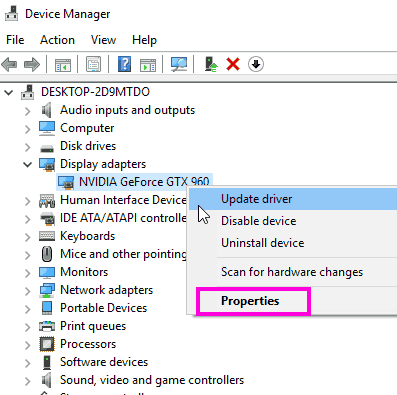 Now, right click on the NVIDIA Graphics Card option from the expanded list, then click on Update driver option. 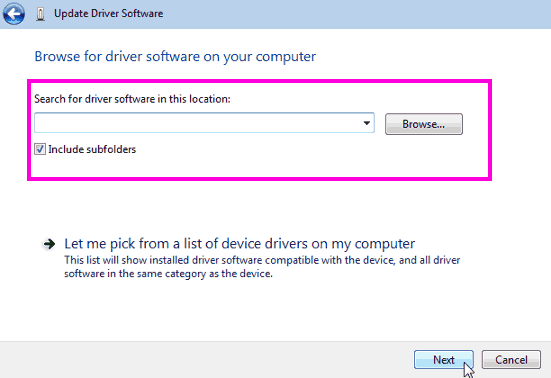 Step 3: From the Update Drivers window that appears, click on Browse my computer for driver software option. 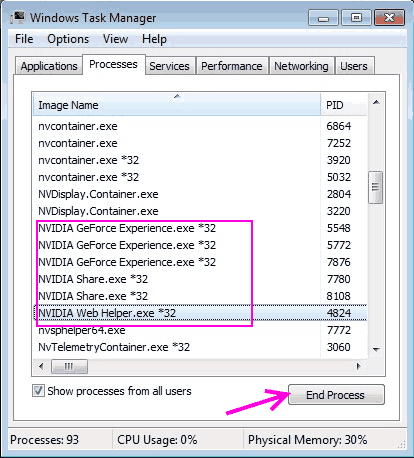 Step 4: Now, you will get an option to browse and load NVIDIA driver from your PC. 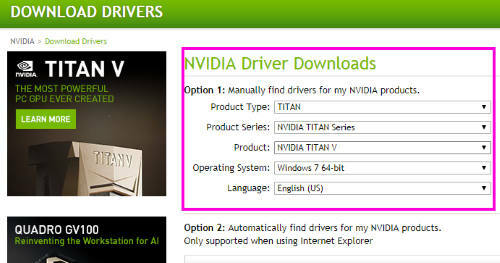 Browse and select the driver you just downloaded from the NVIDIA Driver webpage. 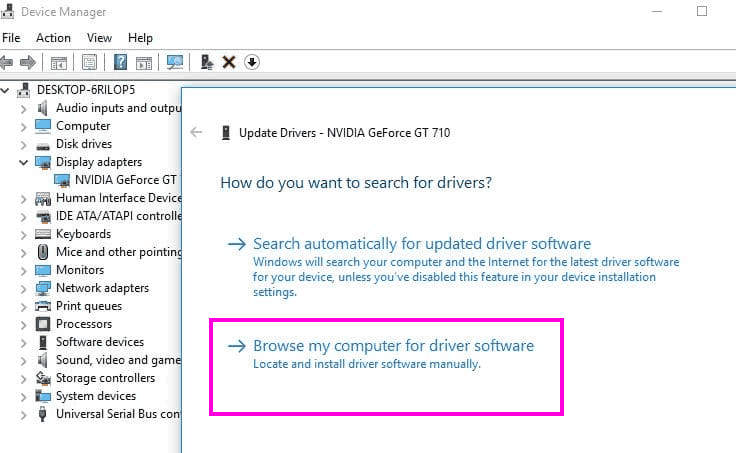 Click Next and follow on-screen instructions to complete the NVIDIA Driver installation. Step 5: Restart your computer and try to install NVIDIA Graphics Card on your PC. If this method to fix NVIDIA Installer Cannot Continue problem didn’t work as well, here’s another method for you. It has been reported that Antivirus software at times can hinder the installation of NVIDIA graphics card on your computer. Although this is not the case all the times, one must try to disable any running Antivirus or Malware when they get NVIDIA Installer Cannot Continue error. First, go to the System Tray of your PC. There, you will find the antivirus or malware running on your PC. You can disable the running antivirus from there. Step 1: Open the Start menu and type Taskmgr. From the search result, click on Task Manager option. 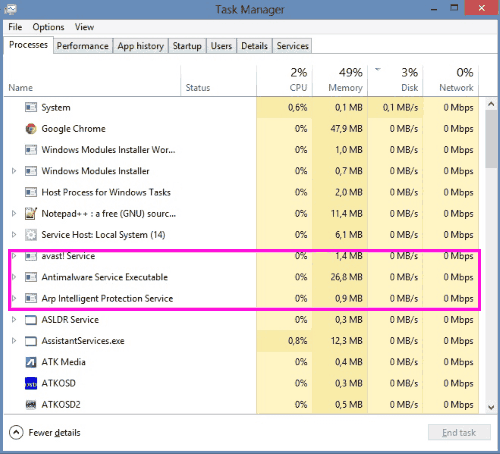 Step 2: Go to Processes tab and look for the running services of your Antivirus. Select the Service and click on End Process button. If you have multiple Antivirus or Malware installed on your PC, repeat the process for all of them. Step 3: Restart your PC. Try to install your NVIDIA graphics card again. If this doesn’t work for you follow the next step. Note: This will be a temporary pause of Antivirus or Antimalware on your PC. Please enable your Antivirus and Antimalware once you are able to successfully install NVIDIA graphics card on your PC. There are many users of NVIDIA Graphics Card all around the world. And, the NVIDIA Installer Cannnot Continue error in Windows 10 is a very common issue which people usually report online. While most of the times the issue is resolved easily, it may take hefty time and effort in some cases. If you are still having the same trouble, maybe you should contact customer support of your PC manufacturer to get them to look into the issue.